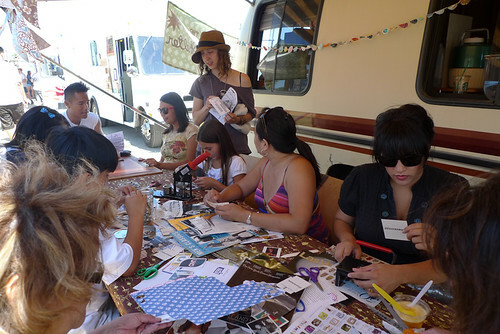 Zine Workshop at Renegade Craft Fair! The winds were gusty, but we managed to instruct five mini-workshops on button-making and zine construction without having all of our supplies blow away! We also brought our zine library and reading room for the perusal of all. This was also an opportunity for us to pass out fliers asking for submissions for our upcoming guide to L.A., a free gift to all vendors at the Zine Fest. What should all visitors to L.A. know? We’re looking for articles about anything and everything–food, good bars, areas where cops don’t care if you sleep in the park–and if you’ve got an idea, start writing! Submissions at will be accepted at LAzinefest@gmail.com until November.